Frugal Mom and Wife: Never Miss A Package Again!! UPS My Choice! Never Miss A Package Again!! UPS My Choice! 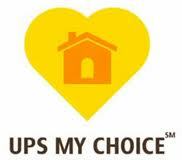 UPS has a new program out called UPS My Choice. UPS is committed to making the online shopping experience better. Not just for shippers, but customers waiting on their packages to arrive, as well. a customizable delivery service for residential receivers called UPS My Choice. Do you order many items online and just missed a package by 5 minutes? Now you have to maneuver your days to catch him again. What if you shipment is delivered with the image of the item? No more worries, find out exactly when your packages will arrive! If you sign up for UPS My Choice, that won't happen again. 100% Free!! This is especially exciting for those of you who enter many contests. With UPS My Choice, even if the company doesn't contact you, UPS sends an email. Know when your packages are coming and control what happens NOW! CLICK HERE to sign up for Free! !